German, 21, was born in Queens and he grew up about a half hour north of Tampa in Spring Hills, Florida. He was not a significant pro prospect coming out of Bishop McLaughlin Catholic High School — Baseball America (subs. req’d) didn’t rank him among the top 500 prospects for the 2016 draft — so he went undrafted and followed through on his commitment to the University of North Florida. As a freshman with the Ospreys, German split time between the rotation and bullpen, and finished the season with a 4.91 ERA and 22/13 K/BB in 33 innings. He pitched for the Madison Mallards of the wood bat Northwoods League that summer and threw 45 innings with a 2.60 ERA and 38/22 K/BB. Baseball America (subs. req’d) did not rank him among the top ten prospects in the circuit after the season. German moved into the rotation full-time as a sophomore and was dominant, posting a 2.43 ERA with 76/26 K/BB in 81 innings. That earned him a spot on the All-Conference First Team and put him on the 2018 draft map. So did his stint with the Wareham Gateman of the Cop Cod League that summer. German struck out 17 in 12.2 relief innings, though Baseball America (subs. req’d) didn’t rank him among the league’s top 30 prospects. As a junior this past spring German emerged as one of the best college pitchers in the country. He threw 91.1 innings with a 1.58 ERA and 108/14 K/BB, and was again named to the All-Conference First Team. German was also a semifinalist for the Golden Spikes Award, which is given annually to the best amateur player in the country. It’s not quite the equivalent of the Heisman Trophy (high schoolers can win it, technically), but it’s close. Baseball America (subs. req’d) ranked German as the 157th best prospect in the 2018 draft class while MLB.com ranked him 191st. The Yankees selected him with their fourth round pick, the 127th overall selection, and signed him within a week of the draft to a below-slot $347,500 bonus. Slot money for the 127th overall pick was $430,400. German is the highest draft pitcher (and third highest drafted player overall) in North Florida history. The Yankees took it easy on German after his big college workload, plus the fact he pitched spring and summer ball the previous two years. He made one tune-up appearance in the rookie Gulf Coast League before moving up to Short Season Staten Island, where he made six starts and five relief appearances. 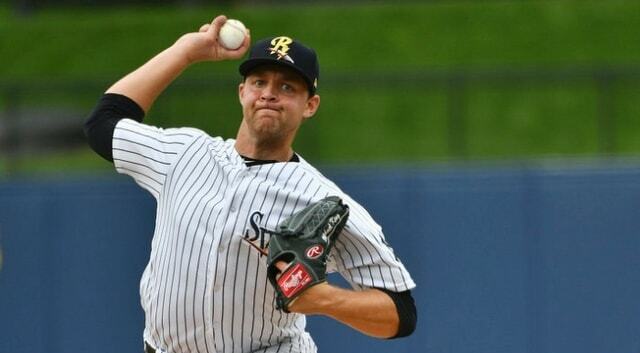 All told, German threw 28.1 innings with a 2.22 ERA (1.44 FIP) and 38/6 K/BB for Staten Island. That works out to a 33.3% strikeout rate and a 5.3% walk rate. German did not participate in Instructional League after the season for workload reasons. The Yankees have already worked their arm strength magic with German. He saw his fastball jump into the 94-96 mph range with a few 98s in pro ball after sitting mostly 90-94 mph in college. The Yankees have a knack for getting their pitching prospects to add velocity and German is the latest example. He was 94-96 mph with Staten Island and we’ll see whether he holds it across a full season in 2019. German’s breaking ball sat somewhere between a curveball and a slider in college and the Yankees are working with him to firm it up into a true slider. It’s a hard low-to-mid-80s offering that has flashed swing-and-miss potential throughout his career. He also has a sneaky good mid-80s changeup that tumbles down and away from left-handed batters. German has the makings of three quality pitches and he’s not shy about pitching in the strike zone.
? German has good size (6-foot-2 and 195 lbs.) and good athleticism, and he repeats his delivery fairly effortlessly. Going forward, the question is whether he can develop that slurvy breaking ball into a legitimate out pitch. If he does, he has enough fastball and enough command and enough of a third pitch to start long-term. If not, German will probably settle into a relief role, and there’s nothing wrong with that nowadays. 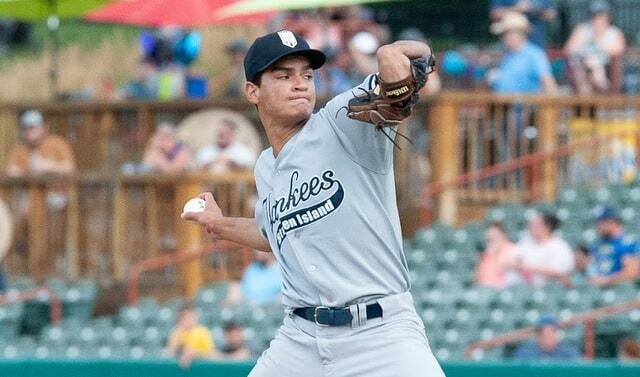 The Yankees have a ton of good lower level pitching prospects and the numbers crunch may determine German’s ultimate 2019 assignment. Normally an Opening Day assignment to High-A Tampa would be the likely outcome for a prospect like this. Albert Abreu, Freicer Perez, and the Garcias (Deivi and Rony) may already be ticketed for Tampa though, leaving just one available rotation spot. Even if he gets pushed down to Low-A Charleston to begin the season, I don’t expect German to stay there long. My money’s on him finishing 2019 with Double-A Trenton no matter what path he takes to get there. I like German. Probably more than I should. I like that he’s already added some velocity (again, we’ll see if it sticks) and I like that he already has a pretty good changeup. Yeah, he does have to figure out his breaking ball, but what do you expect from a fourth round bonus pool saving pick? 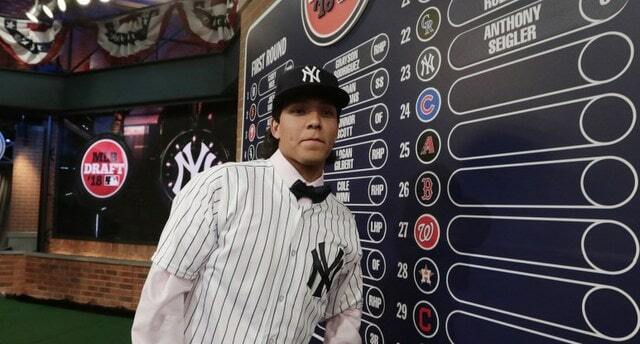 (Some of the $82,900 the Yankees saved with German went to second rounder Josh Breaux.) You’re not getting three MLB ready pitches and command in the fourth round. I’m not sure the numbers will tell us a whole lot about German next season. As successful as he was in the Atlantic Sun Conference the last two years (ASUN is an MLB pitcher factory), I’m not sure Low-A and High-A hitters will challenge him much. Throw enough strikes with the fastball and flash a good secondary pitch and you’ll do okay in Single-A ball. We might not learn much about German until he reaches Double-A, which of course could be as soon as next year. I don’t see a future star or anything, but I think the tools are there for German to be a useful big leaguer in the future. Winter prospect ranking season is underway and, last week, Baseball America (subs. 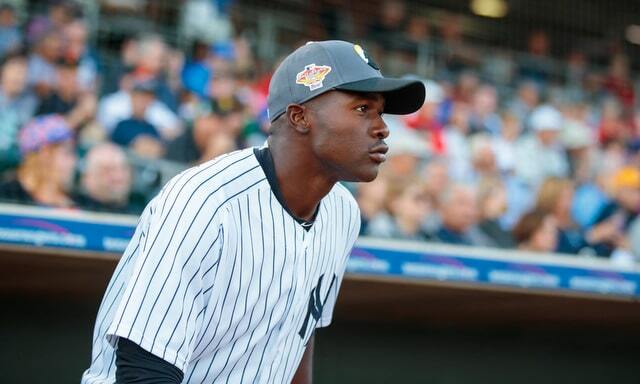 req’d) released their latest top ten Yankees’ prospects list. “The Yankees’ farm system is as deep and diversified as a well-planned investment portfolio … It has so many talented young pitchers and enough athletic and strong hitters that the team is well-equipped to make trades while retaining a strong core of prospects for the future to continue to build around,” says a separate write-up. Seven of the ten names are the same as my most recent top ten list. I was lower on Garcia (15th), Cabello (31st), and King (unranked). King being unranked on my August list is egregious. Big blunder by me. I’m always slow to run young international kids like Cabello up the rankings. Garcia? Eh. The difference between 7th and 15th isn’t that big. Anyway, some thoughts on Baseball America’s rankings. 1. The Yankees have some stud 17-year-olds. And Pereira is the most impressive. “He doesn’t have any 70- or 80-grade tools, but some scouts were confident enough to put future plus grades on his hit, run and raw power already. They also saw a defender in center field with plus range and instincts with an average throwing arm,” says the scouting report, and again, we’re talking about a 17-year-old. Periera hit .263/.322/.389 (88 wRC+) with three homers and a 32.8% strikeout rate with rookie Pulaski this year, so he didn’t blow the doors off the Appalachian League, but he was basically a high school junior in a league with college kids from this year’s draft, high schoolers from last year’s draft, and international signees from two years ago. The scouting report gives Pereira four potential plus tools (hit, power, run, field) and another average tool (arm) and that’s awfully exciting. He has a very long way to go to get the big leagues. The present ability is very good compared to other 17-year-olds. Pereira is among the guys I’m most excited to follow in the coming years. 2. Seigler’s intangibles are off the charts. With Miguel Andujar graduating to the big leagues, Seigler is my favorite prospect in the system at the moment. A switch-hitting catcher with some thump and good strike zone knowledge — Seigler had more walks (14) than strikeouts (12) in his 24-game pro debut this year — who projects to be an above-average defender behind the plate is my jam. Seigler was also praised for his makeup and grinder mentality before the draft, with Baseball America (subs. req’d) saying “he is consistently referred to as one of the toughest players in the prep class” in their pre-draft scouting report. The top ten write-up says Seigler went “so far as to request a Spanish-speaking roommate so he could work on learning the language” this summer. Pretty awesome. The advantages of being bilingual go beyond the catcher-pitcher relationship. It helps in the clubhouse too. Cliques form in baseball. The Latin American kids, the relievers, the veterans, whatever. It’s only natural for a population to split into groups. Anything that helps bridge the language gap and bring groups together in the clubhouse is a big plus in my book. 3. No one really knows what to expect from King. King, who came over in the Caleb Smith trade last winter, had an undeniably excellent season in 2018. 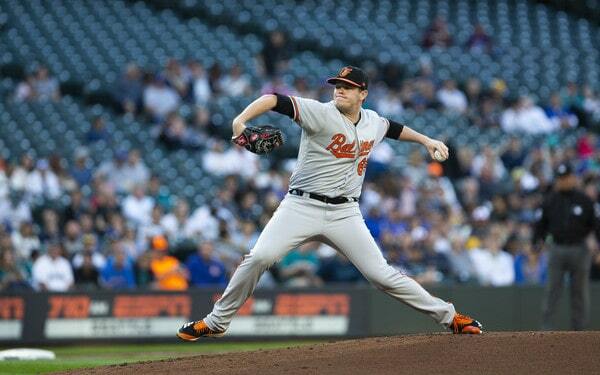 He threw 161.1 innings at three levels with a 1.79 ERA (2.76 FIP) with 24.4% strikeouts and 4.7% walks. King reached Triple-A Scranton and is all but certain to get a look in Spring Training as a non-roster invitee. “In the six years I’ve done this system, I think he has given me the widest range of outcomes. I’ve heard anything from seventh inning reliever to Roy Halladay-lite,” said Josh Norris in the Yankees’ top ten podcast. The scouting report says “plus command” helps King’s arsenal play up, which is good, because “none of King’s pitches is truly a knockout.” He’s a sinker/cutter/changeup/slider guy. I’m not really sure what to make of him. Maybe he’s an Adam Warren type? Or maybe it will work as a starter in the AL East? We’ll find out soon enough. The scouting report calls King “one of the safest bets to have a big league career” among pitchers in the system, and considering what the Yankees gave up to get him, turning two fringe 40-man roster guys into a big league anything is a pretty good outcome.
? 4. Cabello is a potential star. Cabello is one of those many impressive 17-year-olds in the farm system. The converted catcher — he is simply too fast and too athletic to keep behind the plate, so the Yankees moved him to center field — authored a .308/.427/.522 (168 wRC+) batting line with 19 extra-base hits in 46 rookie ball games before he dislocated his shoulder diving for a ball in the outfield. Cabello did need surgery and is expected to be ready for Opening Day. Anyway, Baseball America posted the entire scouting report on Twitter, so make sure you check it out. They say Cabello has a “chance to be a true impact bat in the middle of the order,” and, on the podcast, Norris compared his hitting acumen to Vlad Guerrero Jr.’s and Juan Soto’s at the same age. Huh. That is some very high praise. That is presumably another reason for the position change. The bat is going to be ready far sooner than the defense behind the plate. As with Pereira, Cabello has a very long way to go given his age, but the fact these two are getting such strong reviews so early in their careers is exciting. The Yankees still have a strong farm system and both guys landing in the top ten tells you they are well-regarded. 5. German has already added velocity. In a separate write-up (subs. req’d), Norris reviewed the Yankees’ 2018 draft class, and he notes fourth round pick RHP Frank German was “up to 98 mph with his fastball as a pro after sitting 92-94 during a dominating junior season.” So the Yankees have already worked their “add a bunch of velocity” magic with their fourth rounder. Pretty cool. It’s all about the arm action, apparently. I’ve read the Yankees (and Dodgers) scout specific arm actions because they know how it works and know how to use it to add velocity. 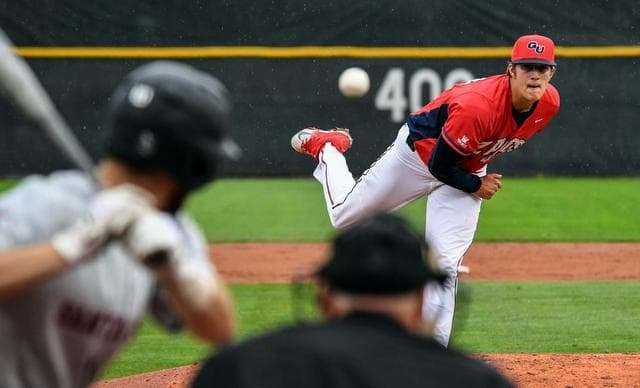 German showed a promising slider and curveball in college, and, in his pro debut, he threw 30.1 innings with a 2.08 ERA (1.39 FIP) and excellent strikeout (34.2%) and walk (5.0%) rates. We’ll see how the newfound velocity holds up over a full season next year. The fact German’s already raised his stock in his short time as a pro is pretty fun though. The 2018 draft signing deadline is Friday, July 6th this year, and already the Yankees have signed nine of their top ten picks. The club made the announcement this morning. The one holdout is UNC RHP Rodney Hutchison, the team’s sixth round pick. He’ll sign once North Carolina’s season ends. They’re currently in the College World Series. Our Draft Pool Tracker page is now live, so you can keep tabs on the Yankees’ bonus pool situation there. The Draft Pool page is available at all times under the Resources tab. You can see all of the team’s picks right here. Here are my Day One, Day Two, and Day Three draft recaps, and here are the latest draft signings. Breaux has well above-average raw power to all fields and an aggressive right-handed swing that generates uncommon bat speed … Scouts were skeptical of Breaux’s ability to stay at catcher when they saw him as a freshman, but he has improved defensively and projects as at least an adequate receiver. His arm strength is an asset behind the plate, though the Arkansas commit needs to improve his throwing accuracy. Breaux hit .404/.532/.831 with 18 home runs and more walks (48) than strikeouts (32) in 56 games as a sophomore this spring, and he was slated to transfer to Arkansas, so he had some leverage during contract talks. That led to the overslot bonus. Between Breaux and first rounder Anthony Seigler, the Yankees addressed their lack of catcher prospect depth in a hurry. Why the overslot bonus? Because Green was committed to Vanderbilt, which is a very tough commitment to break, historically. The Yankees gave Dellin Betances a $1M bonus as an eighth round pick back in the day to buy him away from Vanderbilt, for example. The discrepancy between Callis and Heyman is essentially an accounting trick. The standard minor league player contract includes $2,500 in bonuses so easily attainable that teams were reporting them as part of the signing bonus. Teams aren’t doing that now, and it’s saving them a little something against the bonus pool. As for Bies, I was surprised to see him get so much because I was under the impression he was a college senior, but it turns out he was a redshirt junior with another year of eligibility. College seniors typically sign for about $10,000. Sometimes even less. Bies was able to leverage that extra year of eligibility into six figures. Good for him. The Yankees also announced the signings of Troy OF Brandon Lockridge (5th round), Bucknell RHP Connor Van Hoose (8th round), Grand Canyon RHP Mick Vorhof (9th round), and UNC Charlotte LHP Josh Maciejewski (10th round). The deals had been previously reportedly, and now they’re official. Lockridge received a $300,000 bonus. Not sure about anyone else yet. Van Hoose, Vorhof, and Maciejewski are all college seniors who likely signed well below slot. North Florida RHP Frank German (4th round) has signed, reports Bryan Hoch. No word on his bonus yet. Slot money for the 127th overall pick is $430,400. My guess is German got something very close to that. Within a few thousand bucks. Troy OF Brandon Lockridge (5th round) has signed, reports Hoch. Jim Callis says Lockridge received a $300,000 bonus. Slot money for the 157th overall pick is $320,700, so the Yankees save a little bonus pool space here. Gonzaga RHP Daniel Bies (7th round) has indeed signed, according to the school’s Twitter feed. Still waiting to hear a bonus. Slot money for the 217th pick is $194,000. Since Bies is a college senior, chances are he signed for considerably less than that. Bucknell RHP Connor Van Hoose (8th round) has signed, reports Hoch. We heard he was in Tampa last week. No word on his bonus. He’s slotted for $159,800. Van Hoose is another college senior who likely signed for something much less than slot. Grand Canyon RHP Mick Vorhof (9th round) has signed, reports Hoch. Slot money for the 277th overall pick is $145,600. As another college senior, bet on Vorhof signing for quite a bit less. Miami (Ohio) RHP Nick Ernst (15th round) has signed, according to his Twitter feed. Slot money for every pick after the tenth round is $125,000. Ersnt had Tommy John surgery earlier this spring and will be out until next year. I seriously doubt he received more than slot given that. Louisiana-Monroe RHP Keegan Curtis (22nd round) traveled to Tampa yesterday, according to his Twitter feed, which is a pretty good indication he’s signing. 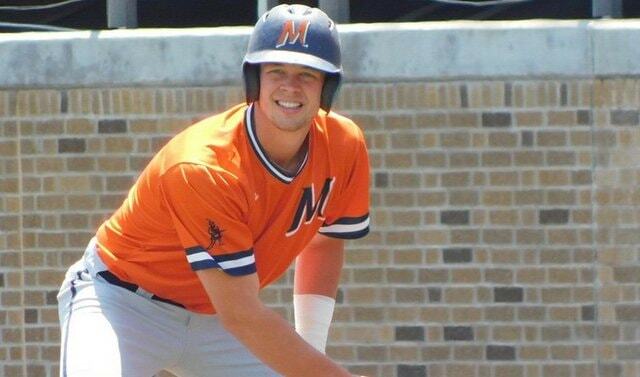 Northeastern 3B Max Burt (28th round) has signed, according to his Twitter feed. He was in Tampa a few days ago, so this isn’t a surprise. Our 2018 Draft Pool Tracker page is now up and running, so make sure you check that out. It is available at all times under the Resources tab. The signing deadline is Friday, July 6th this year.